‘Dogu’, a human-shaped biscuit ware, had been made in the ‘Jomon’ period(12,000BC-3,000BC), before rice cultivation was introduced into Japan. Unlike ‘Haniwa’ biscuit ware in the ‘Kofun’ period(3rd-7th century), ‘dogu’ was made in the hunting-gathering era. Since most dogu are regarded as a figure of a woman, whose breasts and bottom are exaggerated, these are thought to have been a token of fertility to be used for a prayer. Although dogu differs in shape from place to place and age to age, its distributional range is centering on the Tohoku Region in Japan. As most dogu are dug up as an incomplete excavation, without an arm or leg, they are thought to have been intentionally broken. In the light of this fact, dogu is thought to have been a religious utensil, which was used to repel an evil spirit by being destroyed in place of a human. 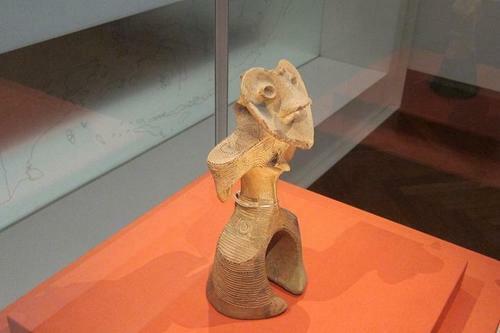 Dogu in the early stages had a simple figure with a flat face, in the course of time, it had gradually changed to be decorative with a thicker face.